After being clouded out last night, and poor weather all night and all morning, I really didn't expect there to be an opportunity to come back to the observatory over the weekend. However the weather cleared up in the afternoon and started to look quite clear. A check of the satellite map showed the cloud moving away and what looked like clear skies heading our way. Jonathan wasn't available so I headed out there myself to see whether I could make a start on the elusive (so far) polar alignment of the Paramount. All the failed nights in here are certainly paying off because it takes very few minutes to be up and running with the scope. 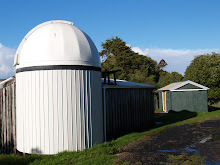 Once we have a pointing model set up and the dome slaved to the scope (planned as soon as we have a somewhere close polar alignment) then it should be a breeze to get everything ready for an evenings observing. First order of business was to see if I could get a rough align by clearing the previous sync and pointing model and telling the scope (through TheSkyX) to go to a star around the south celestial pole (I chose one of the three stars in a small triangle in Octans) . Sounds simple - but no go - the scope ended up pointing somewhere near zenith. Still encouraged by the low rate of drift, I decided to jump straight into the drift alignment process hoping that we were close enough for this to work. Part way through the clouds came in giving an opportunity to write up last nights blog, and threatening to shut down the operation again - fortunately tonight though they lightened off and then cleared completely. Backwards and forwards between the eastern horizon and the meridian I gradually tweaked the altitude and azimuth screws (only going the wrong way once thanks to my cheat notes i chalked on the pier ("star goes up, tighten this screw" and "up=higher") - until eventually after a few iterations there was no real noticeable movement for 5+ or so minutes each side. Of course this can (and will be) improved and refined - but certainly a good starting point. It was getting late, and a little chilly in the dome but I decided I should at least take a picture of something before I locked up. 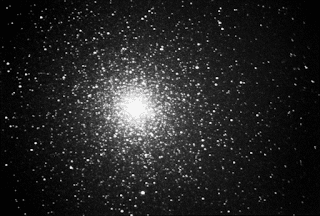 The image of 47 tuc certainly isn't the best in the world, but it representsthe completion of another successful evening's work out at Kumeu, and another step on the journey to breath new life and bring new blood into the observatory so we can really start making use of this great facility.